I have laminate flooring throughout the downstairs of my house, it’s the flooring that works best with kids and pets. It’s robust, and it small houses it makes the space look, unified, bigger and more airy. Keeping it clean is quick and easy. 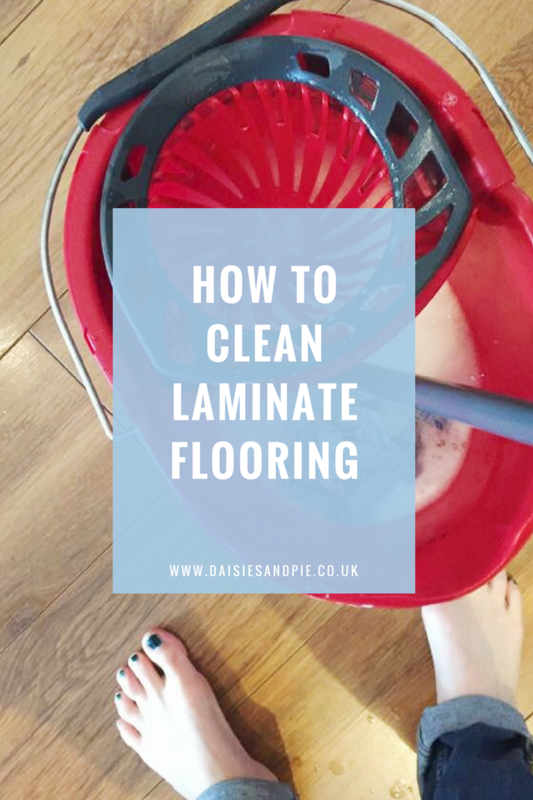 Here’s how I clean laminate flooring. wipe up spills quickly – always soak up spills and splashes quickly, liquid can soak into laminate flooring and drip down the joints which will spoil it. So I move them quickly. vacuum daily – pets and kids mean I do vacuum laminate daily using the soft bristle hard floor vacuum head, this makes sure the floor doesn’t get scratched. It’s really quick to vacuum laminate, literally minutes, so it’s worth doing as the cleaner you keep it and the better you look after it, then the longer it stays looking good. mop carefully – it’s never a good idea to get laminate flooring soaking wet, so I only mop it a couple of times a week. I use a tiny squirt of ordinary dishwashing soap and add a splash of vinegar into the water, this helps to cut through the dirt and helps to remove residue from the laminate, which can make the laminate look dull. Making sure the mop is really well wrung out, I lightly mop the floors, so that they’re scarcely wet. Then once I’ve finished mopping, I go over it with a dry, soft floor mop to dry and buff the floor. Click here for more home cleaning tips. Don’t forget to subscribe below and get our new posts delivered straight to your inbox.